"A wonderfully easy cheese ball that goes perfectly with your favorite crackers or bread!" 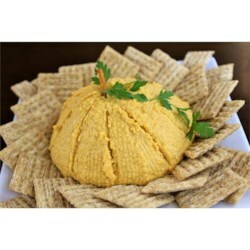 Beat Cheddar and cream cheeses in a bowl with an electric mixer until smooth. Stir in the pumpkin, pineapple preserves, allspice, and nutmeg and mix well. Cover and refrigerate for 2 to 3 hours. When the cheese mixture is firm, shape it into a ball. To make it look like a pumpkin, score the sides with vertical lines using a butter knife. Add the pretzel rod for a stem and transfer to a serving platter.